• Companies participating in the event are encouraged to hire veterans and their spouses from the event. 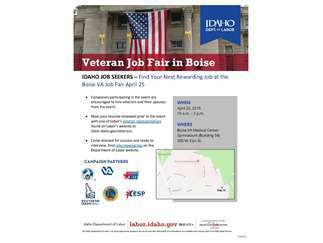 • Have your resume reviewed prior to the event with one of Labor’s veteran representatives found on Labor’s website at labor.idaho.gov/veterans. • Come dressed for success and ready to interview. Find interviewing tips on the Department of Labor website.